​full time librarian in a fully funded campus library. in support of student achievement and the mission of the school. Every HISD student deserves a full time certified school librarian and a fully stocked library. The mission of Students Need Libraries in HISD is to make this happen by persistently providing information to the HISD School Board, HISD librarians and their stakeholders students, parents, community residents as well as campus and district personnel. 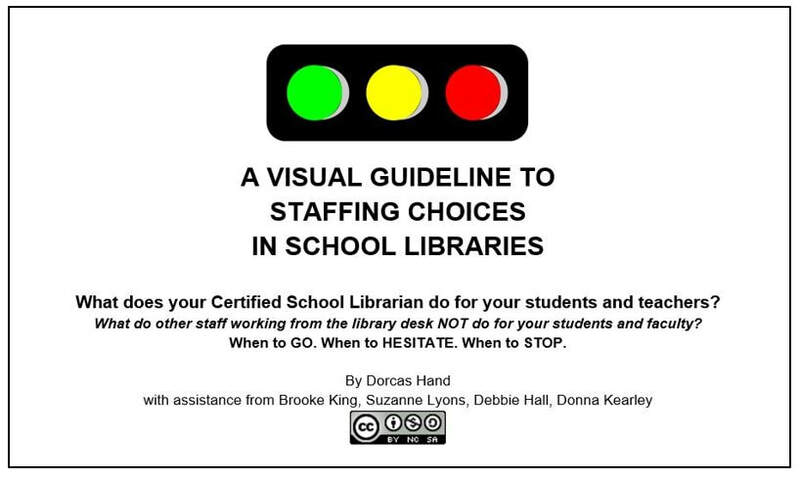 Available in booklet format for printing as well as full-page format with internal bookmarks for desktop access, this 2018 project offers all stakeholders a visual guide to the multi-faceted skill set of certified school librarians. Please share widely! Principals Know: School Librarians are the Heart of the School was crowdsourced by Dr. Judi Moreillon and Dr. Teresa Starrett using funds provided by the Texas Library Association, Demco, and the Dean's Research Funds (College of Professional Education, Texas Woman's University). This video from the Washington Library Association was published in early 2013. HISD school libraries could and should look like these! Funding is not stronger in Washington state, but priorities are different. This video inclides HISD librarians. Thanks, Capstone. A video from the Washington Library Association published in early 2013. HISD school libraries could and should look like these! Funding is not stronger in Washington state, but priorities are different. offers this student statement of their Right to a Library. "Access to a library of five hundred books or more balances the effect of poverty."